To mark the 50th anniversary of the discovery of the world renowned Eastern Tomb at Knowth, we are publishing free online our six books on Excavations at Knowth via the Digital Repository of Ireland. The Academy’s aim is to spark new research on Knowth and to help those researching the newly discovered sites in the Unesco World Heritage site of Brú na Bóinne. Knowth is the biggest of the passage tombs discovered so far - bigger than Newgrange - and boasts the largest collection of Neolithic art. It is older than the Egyptian pyramids and older than Stonehenge. Extracted from 'Excavations at Knowth volume 6: The passage tomb archaeology of the Great Mound at Knowth', and now available online. This project is in partnership with the Department of Culture, Heritage and the Gaeltacht. Commenting on the launch, Minister Josepha Madigan said “It has been a summer of fantastic archaeological discovery at our World Heritage Site of Brú na Bóinne, discoveries which have enthralled many right across the globe. Our shared mission is to make our heritage accessible to all and it is fantastic that the results of these internationally important archaeological excavations at Knowth are being made freely available to researchers and to the public who share our fascination with the archaeological wonders of Brú na Bóinne”. The Neolithic passage tombs at Knowth, Co. Meath, date to approximately 3,200BC. The site consists of one large tumulus (the Great Mound, which houses two large passage tombs) and 20 smaller satellite tombs. 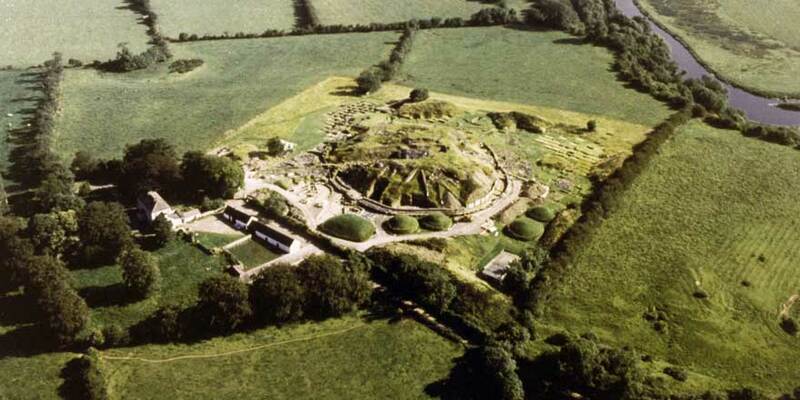 Overall, Knowth has had a history, though not continuous, of ritual and settlement spanning roughly six-thousand years—from the beginning of the Neolithic to the modern era. The books and other archive material that make up the collection being launched, including photographs, can be accessed at the Digital Repository of Ireland, a national digital repository for Ireland’s humanities, social sciences, and cultural heritage data. The printed books are available from the Academy's online bookshop. Photographs courtesy of the National Monuments Service and Ken Williams. The launch of the 'Excavations at Knowth' digital resource took place on 21 August 2018 at Brú na Bóinne Visitor Centre, at an event designated as part of the European Year of Cultural Heritage 2018 programme.